A restaurant-goer could not wish for a more accommodating host than Vural Oktay, who owns the Istanbul Kebab House with his wife, Jacqueline. He makes a point of holding doors for ladies. He’s genuinely concerned about whether diners enjoyed their meals, and, most importantly, Oktay is an able leader on a culinary journey that most Vermonters are taking for the first time. 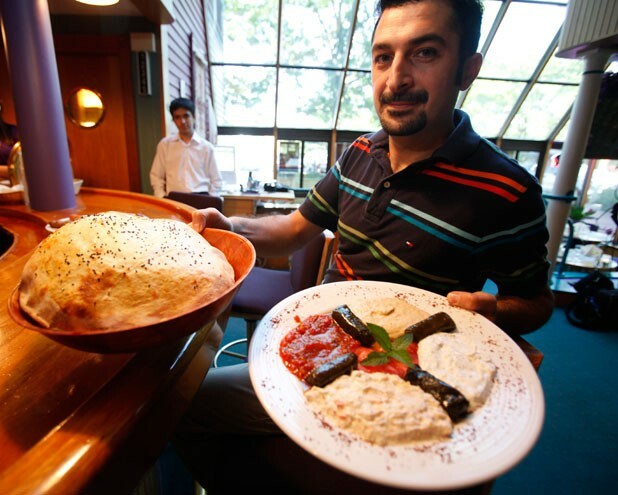 His knowledge of the history of Turkish food is a treat in itself. But Oktay, who opened Istanbul Kebab House in Essex Junction’s 10 Kellogg Road apartment complex at the end of May, still has a few things to learn about the restaurant business. Despite my fears to the contrary, the eatery’s location is not among its problems. Though the building that previously held the Eclipse Grill and the Hideaway is set off from the road, its seclusion doesn’t seem to be hurting business. On a Monday night, the 60-seat restaurant was nearly full at 7 p.m. The next Thursday at dinnertime, attendance was again respectable. Diners are spread out in three areas: a front room with an angled, ceiling-to-floor window; a cozy back dining room; and a balcony-like loft up a flight of stairs. As in the days of the Eclipse, borders and railings are painted aqua, and several walls are lavender, creating an ambience that one of my dining companions compared to Jack Tripper’s favorite watering hole on “Three’s Company,” the Regal Beagle. Turkish cityscape photos, rugs and a samovar lend the quirky space an ethnic touch. The menu is equally sprawling, with about 50 dishes, from appetizers to entrées to desserts. The ambition is enviable, but for a restaurant just starting out, it seems like a lot to take on. Even more daunting are the prices. Entrées start in the $13 range and go up to $21.95. The mixed-grill kebab plate that I shared for an early, not-for-review meal was $32.95 and sufficed for sharing only with the addition of appetizers. I found little rhyme or reason to the staggering price gaps. Lahmacun, or Turkish pizza — consisting of seasoned ground lamb on hand-rolled dough with a side salad for a fresh, DIY topping — cost a reasonable $5.99. Yet just below it on the menu was a Turkish flatbread called sucuklu pide for $13.99 — an appetizer price I’m more accustomed to seeing at special-occasion fine-dining establishments. Could it really be worth it? We decided to find out. The rustic, homemade flatbread was boat shaped, with dough rolled up at its corners around clumps of moist egg and mozzarella cheese. Those familiar with Balkan food will recognize the tangy, pepperoni-like flavor of sucuklu sausage. The salty, fatty meat paired brilliantly with the egg and cheese for a delightful, breakfast-style pizza. It was good sized, too, with the ends hanging over a large plate. In fact, our waitress lost one slice to this precarious positioning while bringing the dish up the stairs. She offered to have an extra miniature flatbread made for us to replace it, but that seemed excessive. This incident typified the puppyish eagerness that I observed in all four young people who served me in one way or another during two meals. Though wanting to please, they seemed insufficiently trained. There was not a spark of recognition when I ordered dishes by their proper Turkish names. The same server who offered to have the mini pide made told us that the beef elbasan was amazing that night, yet couldn’t specify just what beef elbasan was. When she called a coworker to help her explain, he struggled with the difference between ground and braised beef. We elected not to venture $20.99 for the mystery dish. Instead, that night we tried the manti, a central Asian dumpling. I was familiar with big, round Uyghur manti and pumpkin-filled Uzbek manti, but had never tried the Turkish version. At Istanbul Kebab House, they resemble tiny sacchettini pasta and are handmade at the restaurant — a level of workmanship that I think justifies at least the $12.99 price tag. Though the pasta was adorable, each piece was so small that the ground-beef stuffing was practically microscopic. The menu said it was spiced, but I couldn’t find enough to tell. What I do know is that the tomato sauce in which the manti were served was pleasantly acidic, though a layer of oil bobbed on top of it. Yogurt added a tangy creaminess, and a liberal shower of sumac brought beautiful color and another layer of bright flavor. We ordered the dish alongside the yogurt chicken adana kebab. More experienced servers might have told us that the combination of sauces on the two dishes was identical. The meal turned out to be a whole lot of tomato and yogurt. However, the flavorful ground-chicken kebab beneath distinguished itself. Blended with red bell pepper and parsley, a dose of paprika gave the meat a hint of pleasant burn. I liked the chicken’s thick sear, too, the result of the lava-rock grill the kitchen uses for kebabs. On my other visit, this time with a local chef friend, we focused more on appetizers. The $17.99 meze platter was an obvious must. It made a great first impression with the arrival of a giant wooden bowl. Inside rested the warm, puffy lavash that we would be dipping in a range of purées. Filled with air, the lavash resembled an unfried Indian puri with black sesame seeds on top, but tasted more like ultrathin naan. Dipping the lavash in yogurt-based haydari reminded me of long-ago Indian meals (in New York) that I’ve missed terribly living in Vermont. The dill-and-walnut-flavored dip was more tzatziki than raita, but you get the idea. Also on the platter, fresh stuffed grape leaves were a bit too sweet for my taste, owing to a large helping of black currants. I would have liked more acid to offset the sweetness. Another squeeze of lemon would also have helped the hummus. Turkish salsa called ezme was better balanced, with its fruity tomato and spicy chiles. The baba ghanoush was best of all. Ultracreamy, it was ideally smoky but also had an unexpectedly strong nutty note, thanks to plenty of tahini. We ordered the sigara böre?i, described as cheese rolls in phyllo, to celebrate my friend’s own homemade phyllo triumph earlier that day. Unfortunately, there was no phyllo in sight. The dough appeared to be rolled-up egg-roll wrappers. We couldn’t unearth any cheese inside the dry dough fingers, either. We much preferred the falafel. The order of five minichickpea croquettes was attractively arranged, alternating with slices of tomato. The falafel was earthy with cumin and chickpea flavor and uncharacteristically airy. Thin slices of carrot and celery brought a pleasant crunch and sweet flavor to the fritters. We also tried a lamb stew, or güveç. Baked in a stone oven, it was served in a fish-shaped earthenware bowl, but there was definitely lamb inside. Lean, tender chunks of it. The thin broth in which it was cooked was sweet and filled with soft tomatoes and onions. It tasted very much like ratatouille. I loved grabbing bits of meat with the veggies in a piece of lavash. It was only after rereading the menu days later that I realized we never got the rice that should have come with the dish. Given the prices, we limited ourselves to one dessert. We had gotten a hard sell on Vermont fusion apple-maple baklava, so we eschewed more traditional kadaif in its favor. Consisting of three tiny squares, the $5.99 dessert was perhaps the most egregious example of overpricing. The nut-filled layers of maple-soaked phyllo combined nicely with baked, cinnamon-flavored apples, but given its Barbie Dreamhouse dimensions, the enjoyment didn’t last long. I hope the same can’t be said of Istanbul Kebab House. Northern Vermont needs a great Turkish restaurant, and in many ways, this one’s on the right track. There are plenty of dishes to love, but others should perhaps be culled so that the cooks can focus on perfecting a smaller number. Though touches such as copper plates and earthenware bowls are beautiful, the meals come without side dishes, making them seem bare. It’s easy to go through a dinner at Istanbul Kebab House without seeing a vegetable. Including rice and salad would make entrées feel more complete and better justify the prices. Of course, it would also help to simply lower those prices. While the meat may be local, there still isn’t enough of it in any one dish to explain, for instance, an appetizer that rings up in double digits. If portions need to be even smaller, so be it. It’s more productive to expose Turkish-food newbies to a few delicacies than to offer them a single dish that breaks the bank. Opportunities to sample would help build a loyal customer base — and with a few such strategic changes, Istanbul Kebab House could prove to be a real Turkish delight. Istanbul Kebab House, 10 Kellogg Road, Essex Junction, 857-5091.